I’ve been thinking about gifts lately. It isn’t Christmas, and my birthday is still twenty six days away, so … take it as a hint if you want. I’ve been thinking about the gifts I’ve given and been given in the past. My mother tells me I am a ‘master gift giver.’ If I am, I learned it from Brad. He wasn’t always the best at giving gifts, but he had the best philosophy. He believed in giving people something they never would have thought of, didn’t ‘need’, and would love. I think that is a wonderful way to take the pressure off gift giving. Too many times, we get caught up in trying to give the perfect, useful, ‘this will fix all the problems in the universe’ gift. It is too much pressure! Many times, when trying to give this perfect gift, we end up getting someone the one thing WE want them to have. Like, say….a lasagna pan we want them to make lasagna in…for us. Not cool. Here is a list of the top ten gifts I have either given or received in no particular order. I am sure there are many more I could add, but honestly, it always surprises me if I remember anything at all! 1. My uncle Paul gave me a Christmas present one year, the only gift I ever remember getting from him. I was about….ten at the time, I think. It was a simple package of paper, pens, markers, a ruler, crayons….and stuff like that. I absolutely loved it. It might be because I usually ended up leaving my grandmother’s house with nothing but (awesome) homemade pajamas, but I think it was because that is something I totally loved and still love today. Paper, ink, art supplies….love it! 2. My mother gave me a really cool wooden box for art supplies when I was in third grade I think. My memory is fuzzy. I remember we lived in a trailer park in Winslow. I had seen the box on the counter and asked if I could have it. She said no, and seemed a bit miffed that I had asked. Apparently, she was planning to give it to me all along. I was always good at ruining my own surprises…. Jumping ahead many years to where my crazy thoughts take me,…. 3. It is a sort of tradition that I give everyone in my immediate family pajamas for Christmas. We would let the kids open them on Christmas Eve. It was something they knew they were getting, but just opening that one present somehow made waiting til Christmas morning for the rest easier. Anyway, one year, I hit the local Kmart and got us all matching jammies. I wasn’t too sure on the sizes but I made my best guess. As the kids opened their gifts, there was stunned silence and then great peals of laughter as they held up the pants. I had gotten the hugest pants I have ever seen. My hubby was not a tiny guy, but his pants would have fit at least two of him. None of the boys were able to wear their jammies that year, but we all had a great laugh. 4. I bit my nails when I was little. I don’t think my index fingers went a week without bleeding for over two years. It was a bad habit I couldn’t seem to break. When I turned 12, my best friend gave me a tiny wicker basket with nail supplies in it. I took one look at those cotton balls, cuticle sticks, trimmers, and shiny polishes and the nail biting stopped. Ever since then, well, up until this semester, my nails have been pretty great. Thanks Renee! 5. Sometimes when I give a gift, even though it fits all the above mentioned requirements, it is still a little bit for me. One year, I gave my sisters pole dancing lessons for one of their birthdays. It was three tickets….one for each of us. Some of you may be surprised that a proper person such as myself did such a thing, but it was dang fun! Only one of us fell to the ground, and none of us got ‘pole burn.’ It was something I’d do again….in the safety of a small studio with only me and my sisters and very few mirrors…. 6. My sister (the runt) is not much of a gift giver. I think she is practicing for the days when she is very wealthy. 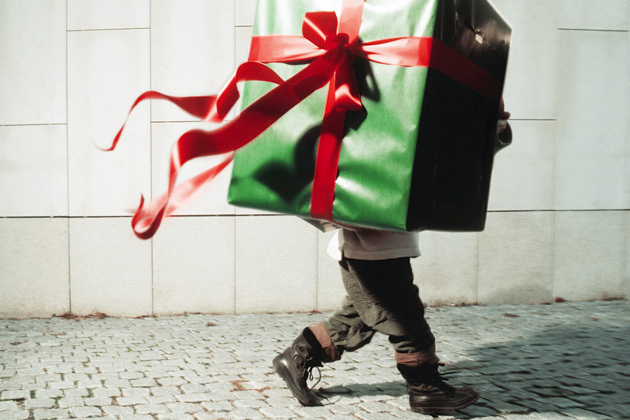 Wealthy people don’t spend their money on gifts….right? They seem to be able to coast through life on clouds of linen and bubbles. Anyway, she did give me a pretty amazing Christmas gift this year. She knitted me two adorable head bands and a custom made t-shirt. The shirt is covered on one side with bleached out cursive words. It looks very cool and trendy. The special part of the shirts is the thoughtfulness she put into her choice of words. It isn’t a cliche French poem or words from a rock ballad, no, it is ‘testicles’ in eight different languages. That is truly a gift from the heart. 7. I have been the ‘gift buyer’ for many a year at my house. I bought for the kids from me an Brad, I bought for the kids from the kids, and I sometimes even bought for myself from the kids. It was an amazing thing to get gifts from my girls this year. My oldest daughter actually bought me a Kindle. I was …..speechless when I opened it. I still am. Love it. My other daughter got me an amazing purple watch for work. I love it! I was surprised that I actually got surprise gifts. Who knew?! 8. Some times the gifts I give have ulterior motives. Don’t judge me…you do it too. One year, I gave my hubby a guitar for his birthday. He hadn’t asked for one, but I really wanted him to play one. He did not disappoint. Not only did he learn it…he learned to play a bit of Spanish music. It ended up being a gift back to me. Well played…..
9. For this one, I have to do a bulk category of all the super sweet, amazing, little things my kids have given me over the years. I love the pictures, hand-prints, Christmas ornaments, rings, necklaces, etc. anything given to me by my kids is priceless. I can’t say I have saved everything, but they have all been wonderful. 10. I did plan this one for last. My dear husband died two weeks before my 40th birthday. It was ironic in a way, he was the one that always looked forward to getting old while I fought it tooth and nail. I ended up aging without him. My birthday was not the highlight of my life that year. I had sweet friends that made me go out and party a bit, but it was a bit shallow. Even though Brad was not there to celebrate with me, he had still gotten me gifts. For several weeks around my birthday, I received little packages in the mail. He had ordered me a collection of pendants from different artisans. They were all very unique and different. They weren’t things I had asked for, nor things I had needed. He had succeeded in surprising me, telling me he loved me, and reminding me of the many years we had been together that had been a series of gifts. Whenever I wear them, I remember him and our life together and it is like he is giving me another gift. I think he should also be given the title of master gift giver…..cause I said so. This entry was posted in Beckie and tagged art supplies, birthday, christmas, desires, gifts, giver, guitar, laughter, master, needs, pajamas, philosphy, pole dancing, sister, tandem flight, wants, wealthy, Winslow, wonderful, wood. Bookmark the permalink.